A couple of weeks ago we were visited by Amanda from The Women's Room. Janine and Amanda met in India and have become fast friends. Below is the full piece. SHOPS GETTING IT RIGHT: JAADU IN DULWICH VILLAGE. When I was staying in Jaipur earlier this year, I was transfixed by the stylish Janine du Plessis, who would come down to breakfast in our hotel wearing elegant dresses in cool indigo cotton with amazing embroidery details and interesting textures. I decided I needed to make her my friend, so brazenly went up and introduced myself to her. It turned out she was on a working trip to buy clothes for her lovely shop Jaadu, which means magic in Hindi, in Dulwich. When started to chat and discovered we had many work friends and experiences in common, as before she became a pilates teacher (which accounts for her terrific deportment) and before she started Jaadu (which accounts for her enviable wardrobe) she worked in fashion. Even more coincidentally, we ended up sitting next to each other on the plane back to London, I’ve learned not to ignore such serendipitous occurrences, so I went over to Dulwich to learn more about her and her store. Janine’s fashion pedigree is impressive, she started off in Butler & Wilson many years ago, then transferred to Browns, where she worked for the legendary Mrs Burnstein, and spent ‘Two amazing years” learning about style. Then the Danish entrepreneur Peter Bertelsen pinched her to work on his bold plan to change the way we shop, by opening individual designer boutiques for Giorgio Armani, Ungaro and Valentino. She then opened her own PR agency, and worked with some of my favourite brands, including Betty Jackson (come back Betty, we miss you), Workers for Freedom, Artwork, Anthony Price and a young start up called Jenny Packham. But, she said “After 15 years I’d had enough of fashion, so I re-trained as a pilates teacher, which I did for 12 years. Then somehow I started a pop up shop selling things I’d found in India, it was all quite coincidental, there was no real planning but it gathered moment and I now have a shop.” And what a lovely shop it is, nicely curated and full of wearable things, where Janine’s years of style experience shine through in the way everything works together. The white loose linen Jaci trousers from Treaty Janine is wearing below her dress (and above here in blue) are a good example, they are super comfy and look great under long shirt tops or dresses. I’ve found clothes I’ve bought from Indian designers come up short on me (I’m 5ft 7) and so I always layer loose trousers or jeans underneath. They cost £86.00 and are generously sized. I ask how much is expensive? “I think that if you really like something and you think you might wear it a lot then price shouldn’t be the first consideration” she says, “but lets be realistic, everyone has a budget.” Injiri dresses are around £200 to £400, depending on the complexity of the fabric make up and design. I also loved the bright silk bangles, £3, from south India, which would add a stylish shot of colour to indigo when worn stacked up an arm. And the hand made, vintage sari necklaces from House of Wandering Silk are also a way of adding a touch of interest to a plain shirt or top. If it’s still blisteringly hot when you are reading this, you might like the cute, comfily generous, printed cotton shorts, £26, which sell super-fast as nightwear, worn with a bright vest, to the women of Dulwich. 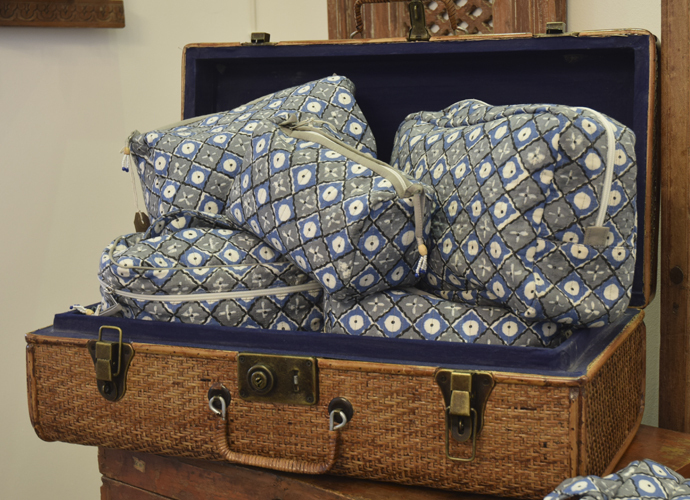 Janine also does lovely block printed cushions, scarves, china and other desirable items from India, as well as her newly launched Present range of wash bags and travel kits that would make great gifts. If you are a Devon inhabitant or are venturing there for your summer holiday, Janine is about to open her second mini-store, within the Dartington Hall complex, which will stock summer weight linens from her Jaadu range. Lucky Dulwich Village having this interesting indie shop on its high street, offering up such an original and well curated lifestyle selection. To see the original piece or to visit The Women's Room for more great content, go here. All words and pictures courtesy of Amanda Carr.